I didn't intend on making stuffed mushrooms when I bought the package of white mushrooms in the market. And I usually wouldn't make stuffed mushrooms in the summer. Actually, I usually only make them for special occasions, but I guess I went a little crazy and stuffed away! Why not, who needs a holiday or event to enjoy something you love? The recipe is by Giada DE Laurantiis who hosts Everyday Italian. No she's not related to me ( I mention her quite often), I just happen to like many of her recipes. It is a very simple recipe and uses ingredients that are always on hand. The only thing I did different is added some chopped mushroom stems to the stuffing. I figured why waste them. Ok two things, I omitted the mint. I don't usually have that on hand. Do you have a recipe that you reserve for holidays or special occasions? Tollhouse Chocolate Chip pie. It is my thanksgiving contribution. Yummmmmm. Want to come to my house next Thanksgiving? 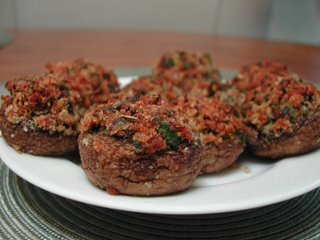 Hi Annie - I'm making your stuffed portabellos tonight - hope they're good! I hope so too. Oh, the pressure! Good luck- Let me know how they turned out. There are pies I only make for Thanksgiving and cookies I only make at Christmas, too. Paula, I reserve Tiramisu for special occasions too. Partly because of the expense and partly because it is sooooo fattening! I love it though. I Said It With Cookies! I've Been Tagged...And You Could Be Next!